On the afternoon of Thursday, April 4th, my father was shot in three different places: the shoulder, the face, and the neck. My dad has been a missionary doctor for many years, dedicating an immense portion of his life to the field. Many people questioned why my dad would go for weeks at a time in such a hopeless, barren place, seemingly placing his own life under his compassion for his work there. Spare a moment to listen to his story, only written by his son's hands. Aware of the conspicuous danger of where they were going, Living Waters spent many months organizing this trip, and of course my dad was willing to volunteer for the expedition. After arriving safely in the airport, the group split into vehicles, and took off towards a meeting hours away. Driving along the small, two lane trails you could hardly call roads, they were met with a road block... it was at this point the team could make out Haitian personnel armed with machine guns. They immediately tried to escape, but that attempt was all it took for the Haitian bandits to open fire on their vehicle. Despite immeasurable amounts of gunfire making a complete wreck of the truck, it was my dad that was shot out of the six other missionaries with him. It's a miracle that even the driver was spared, but unfortunately my dad was left with more than one and a half liters of blood lost and clinging to life. After days, my dad was finally medevaced and taken to Delray Medical Center. A bullet was found in his cheek, his shoulder, and one touching his spinal chord. It's a miracle that he survived for so long without proper treatment, it's a miracle that he isn't paralyzed. Prayers are most important to my family, but the transport, surgeries, and medical bills are overbearing. My father lacks loss of wages insurance, and he has a long road of recovery before he will be able to do anything. Thank you for your concern and prayers, and feel free to contact his Facebook account for graphic videos of the shooting in Haiti and the miraculous story told in detail by team members, as well as updates on his current condition. I know that dad has many friends that love him dearly, and I thank you for always standing by him. Hot off the press! This is a video documentary made by Jeff Lee, the missionary that stuck by Dr Doug's side until he was safely stateside. Jeff shot video throughout the shooting aftermath and is finished editing! Please pray for Doug as he is still unable to swallow. He is finally getting fed through a tube. His weight this morning was a shocking 53.7 kg which is only 118 lbs. His weight at age 14. He is weak and struggling with pain but is in good spirits. That second surgery really knocked him back. He wants to thank everyone who has towed the prayer line and given so generously. He cries every time I read him the beautiful comments that people leave. I just wanted to give an update on Doug's condition. 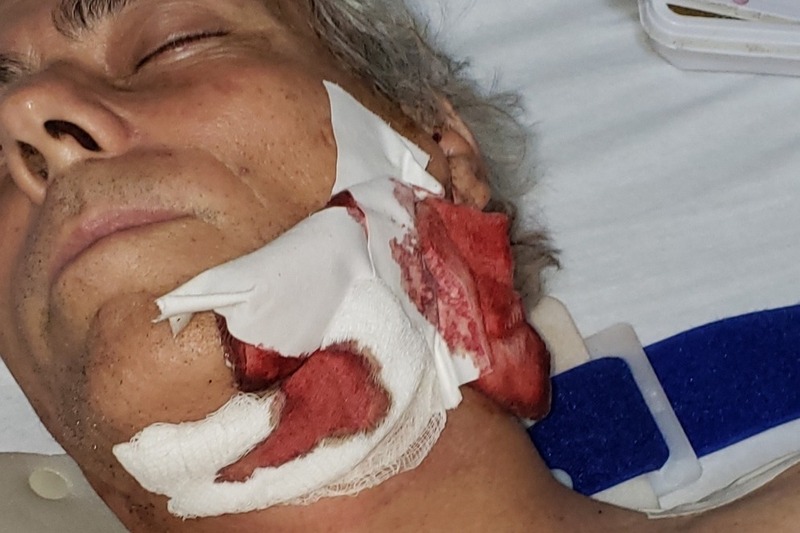 Doug has not been able to swallow after the surgery to remove the bullet from his neck as they had to go through the back of his throat through his mouth to remove it. The doctors are going to keep him off food for another 3 days. Doug is down to around a 130 pounds at this point. Please continue your prayers for him as he is having a really rough time right now.